It appears that nothing can stop Olive Garden. Darden Restaurants (DRI), the owner of the popular Italian food chain, reported earnings and sales on Tuesday that beat Wall Street's forecasts. The company also raised its profit outlook for the year. Overall sales were up nearly 6% to $1.69 billion --- that's a lot of breadsticks and fried lasagna bites. Darden has now reported six consecutive quarters of sales growth. It's been an impressive turnaround for the company since activist hedge fund and Darden shareholder Starboard Value Partners went on a campaign against it. Starboard first took a stake in Darden in December 2013. The fund quickly started to pressure Darden to make changes, particularly at Olive Garden. Last September, Starboard released a 294-slide presentation that criticized Olive Garden for not salting its pasta water, putting excessive amounts of sauce on its food, and having non-Italian items on the menu. It also said Olive Garden was wasting too much food. Starboard then pushed to seize control of Darden's board ... and won. Following Darden's shareholder meeting in October, CEO Clarence Otis soon left. COO Gene Lee was promoted to the top spot, and Starboard CEO Jeff Smith became the company's chairman. Since then, Darden has taken several steps to boost sales and profits at Olive Garden, which accounts for nearly 60% of Darden's total sales. Darden also owns LongHorn Steakhouse and The Capital Grille. It sold Red Lobster to a private equity firm last year. 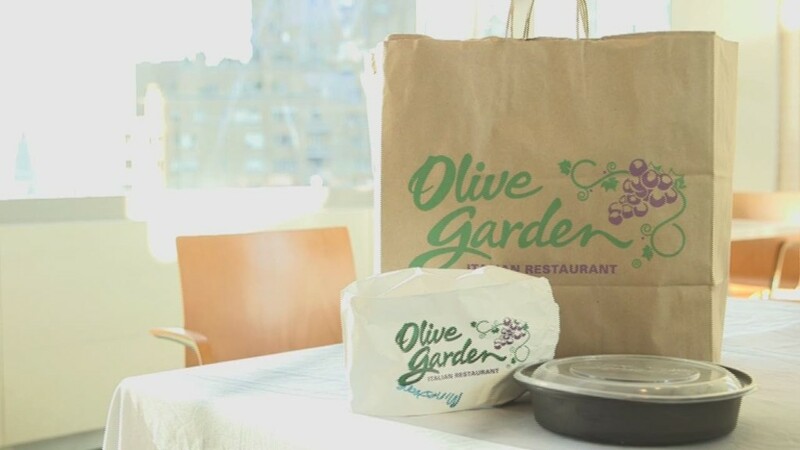 Olive Garden brought back its "Buy One, Take One" program for a limited time in March. That gave diners eating at Olive Garden the choice of a free entree to take home as well. The company is doing more with its popular breadsticks, recently unveiling breadstick sandwiches. And Olive Garden just reintroduced its Unlimited Never Ending Pasta Pass, a limited offering for select customers. Incredibly, the first 2,000 passes sold out in less than a second, according to Olive Garden. Olive Garden said it plans to give away more pasta passes on social media. Lee said in the company's press release that Darden was benefiting from an increased focus on customer service and "culinary innovation" as well as more discipline to keep costs down. And cost cutting has been key to the turnaround. Olive Garden's same-store sales rose 2.7% in the most recent quarter ... but profits surged nearly 30%. Still, it's not all rosy at the Olive Garden. Even though sales are up, it looks like the company is still relying on its faithful customers to continue coming back. It is not attracting many new customers. A big chunk of the sales increases at Olive Garden were a result of higher menu prices and consumers eating more. Overall restaurant traffic (i.e. the number of people going to the restaurants) was up just 0.3% in the quarter and that was just because of a big surge in July. In fact, traffic at Olive Garden was down from a year ago in nine of the past twelve months. That may be one of the reasons why shares of Darden fell 2% Tuesday morning. Then again, the whole market tanked Tuesday. And Darden's stock is still up more than 15% this year. Darden's other chains are reporting even stronger same-store sales growth than Olive Garden. So that is helping. But Olive Garden must do more than just keep its loyal fan base happy. It has to convince the skeptics who've snubbed their nose at Olive Garden food to give its pasta bowls a try. That may be a tough sell. -- Aaron Smith contributed to this report.